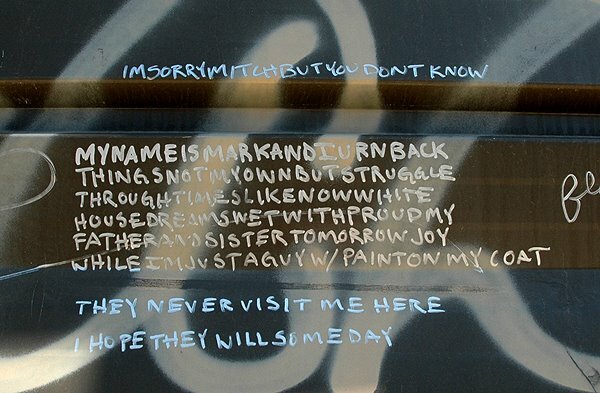 This carefully scrawled artistic angst in the Burg is written near the landmarked-delandmarked-relandmarked-delandmarked Austin Nichols and Co. Warehouse building designed by Cass Gilbert at 184 Kent Avenue. You know, the one that is about to be converted to condos. "I'm just a guy with paint on my coat," the graffito writer writes. With construction starting on the thousands of waterfront and other luxury condos units already zoned and approved, the only people splattered with paint at some point in the not too distant future could be the ones painting walls in the million dollar condos. A few minutes after I shot this photo, as I was taking pictures of 184 Kent, a Hasidic man going into the building saw me and asked, in a friendly way, "So, you like the area?" It was the third time in less than a year that different Hasidic men in Williamsburg had asked me the exact same question when they saw me shooting pictures. (Although one also asked if I shot portraits because he needed some done and another seemed concerned that I might be looking for evidence of construction permit violations.) Is this the Hasidic Williamsburg equivalent of, "So, you like the weather?" Or, having hit the real estate jackpot, are they trying to reassure themselves that people really are paying a million dollars for apartments in Williamsburg?